​What is The Prairie Garden? The Prairie Garden is a digest-sized, soft-covered book published annually by a volunteer committee consisting of about 12-15 members. The work is organized by the editor and an annual guest editor. Each year, a theme is selected from which a large portion of the articles follow. The theme articles are the responsibility of the Guest Editor, who is chosen because of his or her knowledge in the chosen subject area. The books are edited in part and as a whole by The Prairie Garden Committee, before being published each year in late winter. Members of the committee often write articles for the book as well as provide images, aside from their role as associate editors. These individuals are what makes this book possible, as are our sponsors, and you, our loyal readership. ​The Prairie Garden Committee began in 1956 as a standing committee of the Winnipeg Horticultural Society, which had published The Winnipeg Flower Garden and The Flower Garden, the precursor of The Prairie Garden, starting in 1937. The book began as the annual report of the Winnipeg Horticultural Society, and was free to members when they paid their annual membership fees. ​It was first called The Winnipeg Flower Garden and included not only the official annual report of the society, but also informational articles by prominent local horticulturists of the time. The name was changed to The Flower Garden in 1955 because of the book’s ever-increasing readership. However, it was only to be called The Flower Garden for two years before becoming The Prairie Garden in 1957, once again because of its ever-broadening popularity, now extending right across the Prairies and beyond and because of its applicability to gardening in this region in general, and not to Winnipeg in particular. Ian's educational and working background is in entomology. After obtaining Bachelor of Science and a Master of Pest Management degree from Simon University University in Burnaby, BC, he worked as the Provincial Research Co-ordinator for Hoechst Canada in Regina for 8 years and as a research biologist at the Cereal Research Centre in Winnipeg for 25 years until retirement in 2013. At the CRC he specialized in developing economic thresholds and sequential sampling plans for insects pest on field crops, and screening wheat for resistance to insect pests. He worked with plant breeders in the development of insect resistance of spring wheat to the wheat midge. He has been an avid gardener for 35 years and grew up in BC on a small acreage where nearly all their fruit and vegetables came from their garden. Before her retirement in 2016, Linda was a professor of German language and literature at the University of Winnipeg. She has also been an avid gardener for over 30 years. Her garden has been featured on a number of tours. As a certified Master Gardener, she enjoys volunteering in the gardening community as well as speaking and writing about plants and garden design. Tammy was guest editor for the 2015 edition of Jensen's Nursery. Tammy reaches out to her gardening network to solicit articles, as well as contributing articles herself, and her business-sense to aid The Prairie Garden's marketing efforts. Tammy has been deeply involved with all aspects of the family-run Jensen's Nursery. Tammy's love of plants, horticultural expertise and business acumen are wonderful traits she brings to the 2015 Prairie Garden. Darlene Belton, M.A., M.Ed., M.G., had a long career in many aspects of education, from teaching high school English in Winnipeg and business subjects at St. Lawrence College in Kingston ON, to fulfilling many administrative and project management roles in continuing education, international institutional development, and adult education. After retiring in 2011, she took intensive training in permaculture and became a Master Gardener. Besides serving on The Prairie Garden committee, she is currently the Volunteer Coordinator for the Manitoba Master Gardeners Association. Andy is now ‘retired’ after a 40-year career with Agriculture and Agri-Food Canada in Winnipeg as a research scientist (plant pathologist) working on diseases of cereal crops. He believes in TPG’s mantra of providing practical, concise, accessible, and locally-written information for prairie gardeners, and enjoys his editing duties with the publication. He has written several articles for TPG to address relevant disease issues in the garden and to relay applicable mitigation measures for these. He resides, in St. Andrews MB. has been involved in a number of capacities related to horticulture education for almost 20 years. He served as administrator of the Prairie Horticulture Certificate at the University of Manitoba from 1997 until 2010, and currently teaches Botanical Latin for the Master Gardener Program at Assiniboine Community College. When not engaged in activities related to his children, or on the home front, he is pursuing a Master of Arts in Military History. Born in Hamilton Ontario, Tom Nagy is an ecologist with a passion for botany and mycology who has worked as an organic farmer, field botanist and environmental consultant. Tom advocates for a greater understanding and appreciation of how we interact with the natural world by writing thoughtful and engaging articles and conducting public programs discussing native plant communities, organic agriculture, mushroom cultivation and wild foraging for edible and medicinal plants and fungi. Tom currently works as a commercial craft brewer for Barn Hammer Brewing Company in Winnipeg. I have been involved with gardening most of my life, starting out as a member of a 4-H Gardening Club at about 10 years old. Since that time I have always enjoyed the work and benefits of planting vegetables and flowers. It has been my good fortune to have been a member of the Friends of the Assiniboine Park Conservatory and the Chair of the Festival of Trees and Lights for about 4 years. I am married and have children and grandchildren, all grown. I am a Marriage Commissioner for the Prov of MB and now consider myself to be semi-retired. I have had a career in mostly business in Office Management, Computer Software Support and Training. And now I can say I am a member of the committee of The Prairie Garden. 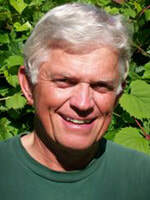 Bill is a LEED accredited environmental consultant and landscape designer-builder. As a Manitoba Master Gardener and urban permaculturalist, Bill loves to incorporate nature into residential spaces. Bill is an active researcher, studying at U of M.
Succulent sweet peas and juicy carrots from my grandparents garden left a deep impression on this child of the 70’s raised in southern Manitoba. Keeping the past relevant as an urban farmer and owner of Renegade Gardens I tend six small regenerative gardens where I produce heirloom vegetables, herbs and edible flowers for local chefs. My pioneering spirit and gardening over the past 25 years lead me to try my luck growing sweet potatoes in our northern climate. I now own Winnipeg Sweet Potato where I produce and supply local growers with a short season variety of sweet potato slips. I love learning, sharing and growing fruit so I also volunteer as an orchard steward and garden club instructor at the Sustainable South Osborne Permaculture Commons. Ontario Diploma of Horticulture, University of Guelph, and member of the Order of St. John Ambulance. Trained as a horticulturist in Frankfurt, Germany, Susanne worked for 30 years at the University of Manitoba as a supervisor of the Department of Botany greenhouses. She has lectured across Manitoba and for Continuing Education U of M and was a frequent guest of CBC Information Radio. Other interests include reading, training, and showing prize winning German Shepherd dogs, therapy dog work, and music. Richard was The Prairie Garden's editor from March 2007 to December 2015 and now volunteers to work on this website. Raised in Winnipeg, he has retired from Creative Retirement Manitoba where he worked for 35 years. Richard received a B.Sc. in biology from the University of Winnipeg. He enjoys photography, the outdoors, computers and music.